It's autumn again and time to make the burgoo! 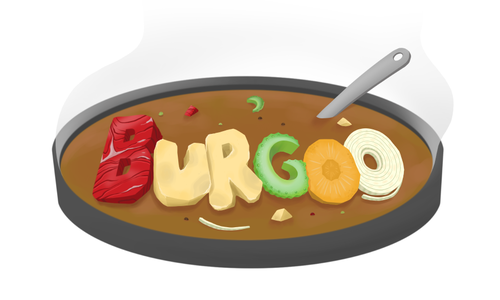 Burgoo is a community-made stew made from savory meats and vegetables. In the game, your goal is to add all of your ingredients to the stew and be the one who sampled it the most! Each player in Burgoo starts the game with a line of twelve ingredients (two of each of the six types) and one ingredient of each type in his hand. The object of the game is get rid of your ingredients on the table and have the most ingredients in your hand at the end. On a players turn he can "sample the stew" by taking an ingredient, split one of his ingredient lines, or cause ingredients to be added to the stew.